This weekend Glenstal Abbey School came second in the 2018 Irish Interschool Championship, and Dunamase College in Portlaoise came fourth. 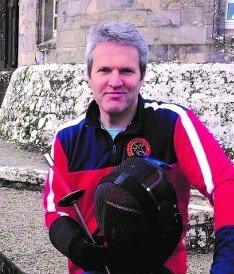 Coach Patrick Dight teaches fencing at both schools. Glenstal Abbey School took an early lead defeating Dunamase and the Royal Belfast Academical Institution in round one. Glenstal B team defeated Dunamase A 45-38 after the lead switched 4 times. Luke Fahy fought hard, winning 31 of the 45 hits. This was one of the closest matches of the day. RBAI B trailed for much of their match against Glenstal A, until captain Ryan Dumigan wrestled back the advantage in a 6-2 bout to leave the Belfast team leading 40-38 before the last 2 fencers came to the piste. A strong finish by the Glenstal anchor Ben Costello gave Glenstal A the final score of 45-41. Clongowes A took victory in the last round one match beating Dunamase B team 45-23. The home side led from the start, resisting a 7 point effort from Dunamase fencer Dagmara Krol mid way through. In round two Clongowes A beat Glenstal A 45-28 and claimed a place in the final. An early lead was created by Glenstal’s Ben Costello before Clongowes captain Kosi Ugwreru wrestled back control after which his side maintained a comfortable lead. They were joined in the final shortly afterwards by Clongowes B who defeated Glenstal B. The Clongowes team lead from the start despite a mid match rally by Glenstal’s Luke Fitzgerald. The grand final pitched Clongowes A and B teams against each other while Glenstal A and B fought for bronze. Both matches followed form with the A teams victorious 45-25 for gold and 45-34 for bronze. The 2018 Irish Interschool Fencing Championship was won by Clongowes Wood College with Glenstal Abbey School second and Royal Belfast Academical Institution third. Runners up Dunamase College were awarded the Maitre Patrick Duffy Memorial Trophy by Fencing Ireland Chairperson Philip Lee who singled out Dunamase for their technical ability and ‘fencing intelligence’.